Every now and then a house comes on the market that fulfills many of the growing family’s wants and needs, and this is just such a home. 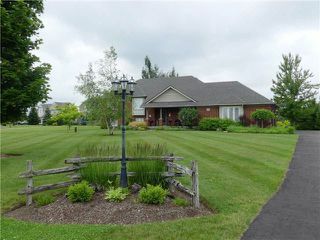 Located on a generous 1.73 acre lot and is just one minute to town for schools and shopping yet situated in a country setting amongst similar homes. If you are looking for breathing space and an exit from the densely populated GTA, this is it. Built by Devonleigh, this gracious home is immaculate inside with gleaming hardwood floors, beautiful crown moulding, wainscoting and has French doors throughout. The main entrance has a covered front porch and gorgeous frosted glass and iron filagre front doors.